APANAMA: BERSIHkan Pulau Pinang ? Should the people of Penang take to the streets and demand for the resignation of DAP chief minister Lim Guan Eng for the state government's failures, abuse and tyranny as contained in the above video footage ? The last video footage of Anwar Ibrahim's lies and false promises to the people of Kampung Buah Pala is a valid reason for the people of Penang to DEMONSTRATE AGAINST the DAP-led state government and demand for Lim Guan Eng's immediate resignation. Why is it that no one is talking about accountability when it comes to Pakatan Rakyat and their bunch of compulsive liars? If our enforcement authorities allow the Opposition-organised Bersih demonstrations to proceed in Kuala Lumpur then I don't see a reason why a similar or bigger DEMONSTRATION be held all over Penang (particularly on the iconic PENANG BRIDGE). There are more reasons for the RAKYAT to demonstrate in Penang as Pakatan Rakyat and DAP have been discriminatory and racists in administrating the state - as clearly stated in the video footage above. I'm sure the former resident's of the now non-existent Kg.Buah Pala would be more than willing to take to the streets together with a host of others who are fearing a similar fate in the near future. 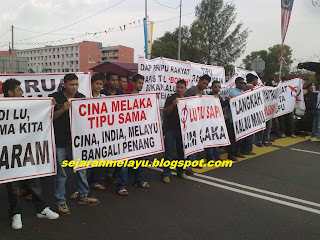 So, would Lim Guan Eng, Anwar Ibrahim and Mat Sabu support a series of big scale street demonstrations in Penang? We could call it JOM BERSIHkan PULAU PINANG can't we? He said that the 30 activists led by Sungai Siput Member of Parliament Dr Michael Jeyakumar Devaraj had distributed flyers deemed to be a threat to national security. "They were carrrying items inciting the people to hate the government. This is serious and can threaten national security," he told reporters here on Sunday. "They include flyers and t-shirts with Chin Peng, Rashid Maidin and Suriani Abdullah - all connected to MCP - written on them." INTERNET polls are really just a way to engage the reader with the aim of taking a quick temperature reading of your audience, in the words of American political analyst John Harwood. It’s the cyber equivalent of asking the room for a show of hands on a certain question, but it can also be manipulated. Most ordinary netizens do not take such polls seriously but the political stake players certainly do, and they are often the ones who would hack and organise such manipulations to get the numbers they want. Harwood, a New York Times journalist, said the CNBC once organised a debate. After the debate, the television station put up a website poll asking readers who had won the debate. Soon, supporters of Ron Paul, the Republican Congressman, who had served notice he was running in the US presidential race, were leading the polls at 75% within hours. It soon dawned on CNBC that the poll was the target of a campaign. So, the station pulled it down. The purpose of the poll was ruined and as Harwood wrote, “it was no longer an honest show of hands”. “That certainly wasn’t our intention and certainly didn’t serve our readers,’’ he wrote, adding that a well-organised “few” could throw the results of a system meant to reflect the sentiments of “the many”. That was what happened to The Star Online poll survey on Monday. Obviously, print journalists adopt a more cautious approach against those in the new media who see politics differently. An online poll on the proposed Bersih 2.0 rally on July 9 asked respondents for their opinion on whether the illegal rally should be cancelled or be allowed to go on. In less than a day, it drew more than a million responses, which caused the online team to suspect that the results were being manipulated. Typically, the online polls attract an average of about 30,000 responses over several days. The Star Online’s unique visitors number about 400,000 a day. The initial examination showed that the The Star Online site logs recorded up to a million votes to the poll page from just one IP address. Acting on the belief that the poll results were tainted, the online editor took it down just before noon on Tuesday. In short, the supporters of the Opposition-initiated rally, Bersih 2.0, were not so clean after all. Even desperate. HOW DESPERATE 'BERSIH' ORGANISER AND CYBER TROOPERS CAN BE IN MANIPULATING THE POLL. AS MY WONG CHUN WAI PUT IT, IT'S NOT SO BERSIH AFTER ALL!!! Turn and twist all you want but you are just too dumb to understand. The issue is against SPR by Bersih. Go fight your other issues on another day. bersih is the one that spinning, against spr? organized by ngo? not involving political interest? hooo, if there's gonna be demonstration at penang bridge, i'm in! Let's organize a BERSIH 3.0 in Penang and see if Anwar and gang will join. Haha. Get this into your thick skull, if it's possible. Bersih represent all Malaysian citizens which include politicions freom both divide, doctors, rubbishmen, taxi drivers, PM, home minister, Samy, CSK, you and million others. So....if everyone is on the same side wanting fair and free election, where's the piltics involve? If your claim to fame is that you oppose a group of people who's only mandate is free and fair elections, you're kind of a dickhead.